Welcome to the very first throwback interview series! Every Thursday at 7PM EST, I will be releasing one of the older blogs that I have released before on my previous platform. I am super excited to release one interview of Lawnmower, a Robinhood for cryptocurrencies. Months after this interview was initially released in early 2017, Coindesk (a media & events business in the bitcoin and blockchain industry) acquired for an undisclosed amount. I am very proud of the three founders and I wish them luck in their current and future endeavors. You can find out more on the acquisition by clicking on this link. How did you come up with the idea? Also, how did you come up with the name? The first iteration of our product was thought up by Pieter at the Money20/20 Hackathon in Las Vegas in late 2014. The app was called “convert your spare change into bitcoin”, inspired by programs like Bank of America’s “keep the spare change” & Acorns which “round up” purchases made with users’ credit & debit cards and use the differential (“spare change”) to save in bank accounts & ETF portfolios. We’d all been fans of bitcoin since 2011 & wanted to make an app that helped demystify the space & tear down barriers to entry for the mainstream public. We extended the concept to saving with bitcoin & thought the name “Lawnmower” represented something along the lines of trimming the top off of purchases or traditional spending & using the clippings to invest over time. We also thought it was catchy & random enough to get stuck in your head. Our product has evolved over time yet remains committed to demystifying the bitcoin & blockchain space and making it easy for the mass market to both learn about & invest in the asset class we love. What’s the biggest challenge you’ve faced so far in your startup journey so far? Getting the word out about our product without a large marketing budget. You need to be pretty creative to get eyes & downloads on your app without simply paying for targeted advertisements. How do you distinguish Lawnmower from your competitors in the investing cryptocurrency industry? 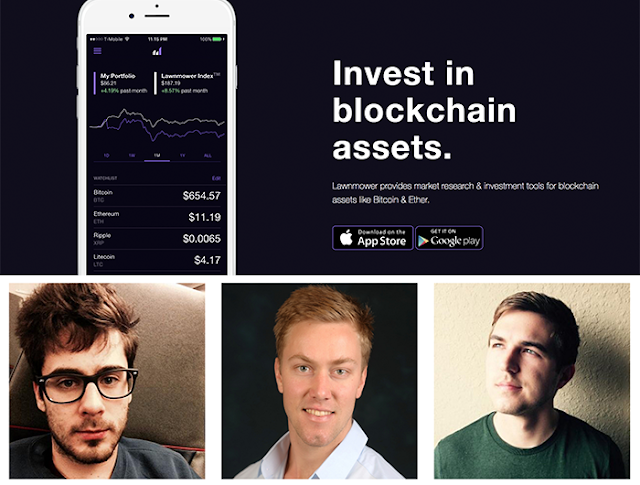 By creating an extremely friendly UI & features modeled off of traditional investment apps like Robinhood in a space that’s plagued with extremely technical & intimidating products that scare off new users. We also write our own news & research to combine both investment tools & information when most other firms seem to focus on one or the other. What are some features we should be excited about in the upcoming updates in the near future? We’re expanding out our investment offerings to assets like Ether. In conjunction with adding new assets we’re building out tools to let you purchase multiple (in the context of a portfolio or index) with the same recurring or instant purchase, & showing you analytics across your multiple holdings. Our research & writing is also going to start to cover upcoming Blockchain Assets that haven’t even begun trading yet (like future ICOs) to help users keep up with the most cutting edge trends & projects. We’re also getting ready to release some promos for new users & existing users that refer their friends to our app. Do you plan to expand your investment options from bitcoin to others such as Ethereum? Yup, absolutely – Ether trading is scheduled to launch on both our iOS & Android apps within a couple weeks & we’re focused on adding support for additional Blockchain Assets as quick as possible. We love the speed at which the entire asset class is growing & want to bring those opportunities to our users as soon as we can. How do you plan to help contribute shape the future of the cryptocurrency industry? By making the easiest, mass market product possible. We really aim to be the pre-eminent app to come to for both learning about & investing in every Blockchain Asset or project our users may have heard of elsewhere, or even being their very first exposure to a new trend or asset. We plan on building out our investment tools, analytics, index products, research, & news to be the most user friendly investment & information platform possible.